Paramedic students have put their skills to an explosive test by attending to casualties in a simulated train crash. Twenty-nine students from University of Plymouth took part in the crisis exercise at Churston railway station, which was organised by Dartmouth Steam Railway and Riverboat Company in conjunction with Torbay Hospital, Devon and Somerset Fire and Rescue Service and Devon and Cornwall Police. 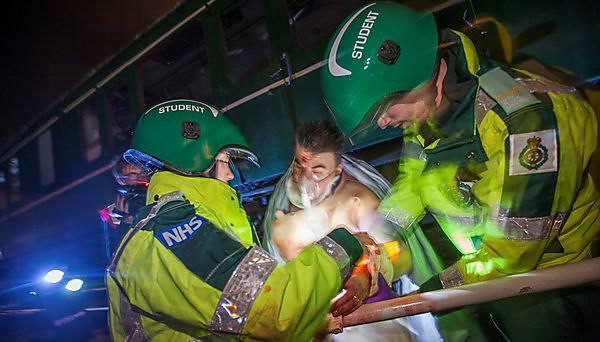 Following a simulated crash and planned explosion, in which first-year paramedic students and local volunteers acted as casualties, the fire officers made the area safe, followed by second and third-year paramedic students attending to the ‘injured’. The exercise took several hours, during which the students had to negotiate unfamiliar surroundings, mostly in the dark, and successfully attend to all of the casualties using the skills they had acquired throughout their degree course. The paramedic practice course at University of Plymouth is largely based on clinical skills, and programme leader Gary Strong explains why the exercise was so useful.